With inspiration from one of my favorite comic book blogs on the interwebs, Comics Should Be Good, I thought we’d spend the week celebrating some of our favorite Amazing Spider-Man covers. Actually, I shouldn’t make this sound so inclusive. This list is exclusively my favorites. Let’s start with some ground rules/criteria. While the CSBG list favored “iconic” covers over those that just looked really cool, I wanted my list to marry the two – because quite frankly there are a few “iconic” ASM covers out there that are not particularly my favorite from a visual standpoint, but I also wanted to make sure I was putting artwork in my list that was instantly recognizable to fellow web-heads and for most of the general comic reading public. Additionally, since the theme of this web site is one man’s chase for every issue of Amazing Spider-Man, I am only using ASM covers for this list – so let me put this out there immediately, Amazing Fantasy #15 is not on this list, despite it being perhaps the most iconic cover in Marvel history. Also, I didn’t consider any covers from other Spider-Man series such as Marvel Team-Up, Spectacular, Web of, etc. Any complaints about those exclusions from this point forward fall on deaf ears. Third, despite my arbitrary criteria, the goal of this list is to reminisce and debate, so please feel free to call me an uninformed idiot in the comments section (though I’d prefer you’d back that statement up with some of your own suggestions for the list). I have no idea how much traffic this site is going to generate during the holidays, so I thought putting up something a little different would inspire some fun around these parts. We’ll get back to our regular schedule (whatever that is) next week. I’m kicking off this list with the most current cover I’m going to discuss (*spoiler alert*) and probably the most controversial. For one, this cover is barely two years old, so it’s impossible to determine the long-term impact it’ll have on the series and the industry. Second, the cover I picked is technically a variant, though if memory serves, it was a 50/50 variant, meaning both received widespread distribution to comic book shops and subscribers. In fact, as a home subscriber to ASM, this was actually the copy of ASM #600 that I received in the mail, not the more traditional John Romita Jr. cover. So if you think this addition is technically a cheat, well … I don’t know what to tell you. I picked this issue, not only because I find it to be visually stunning and dramatic, but also because I think Alex Ross is a true rock star when it comes to comic book art, and I would be nothing short of thrilled if Marvel had him illustrate a couple of ASM covers every year. For those of you living under a rock the past 15 years or so, Ross has one of the most distinctive styles in the realm of comic book art. His painted visuals almost take on the look of renderings. His human characters are incredibly realistic. Marvels, where Ross first garnered acclaim, is one of the most beautiful comic book series I have ever looked at. Every panel/cover of that story is a work of art that I would gladly hang in a museum if there was such a museum dedicated to nerdy works of art. But beyond being so distinctive, Ross also has this way of honoring the roots and tradition of what he illustrates. It’s a rare gift to be both outside-the-box, but still familiar. 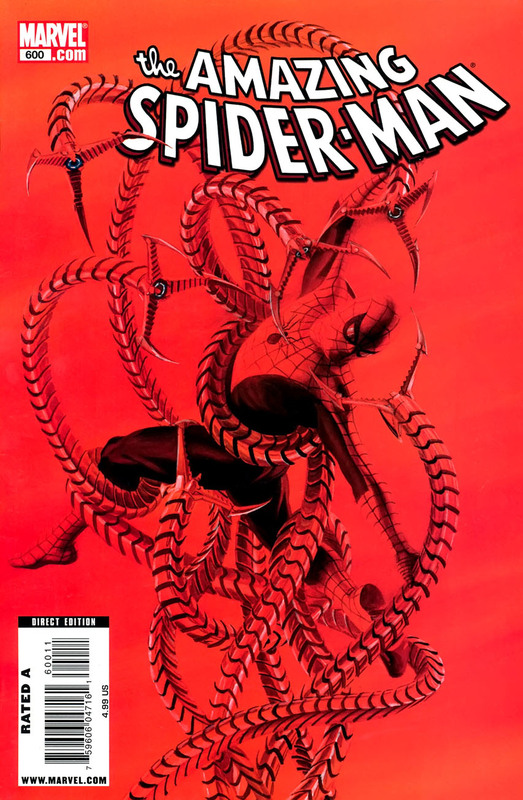 Looking at the cover of ASM #600, I can easily visualize this encounter between Spidey and Doctor Octopus as if it happened sometime during ASM’s first 100 issues. Wasn’t Spider-Man tangled up like this in Doc Ock’s mechanical arms during their first encounter in issue #3? Or was this visual based on one of John Romita Sr.’s works of art from the latter half of the 1960s? Either way, I love what Ross has done here. It’s also an epic enough visual befitting of a special anniversary issue. You’ll find as the list goes along that I have a tendency to favor the anniversary issues when it comes to artwork. Marvel has always done a wonderful job of elevating these issues from both a storytelling and artwork perspective. In the same vain, those anniversary issues that don’t have a particularly memorable cover, tend to be not be memorable – period – for me. 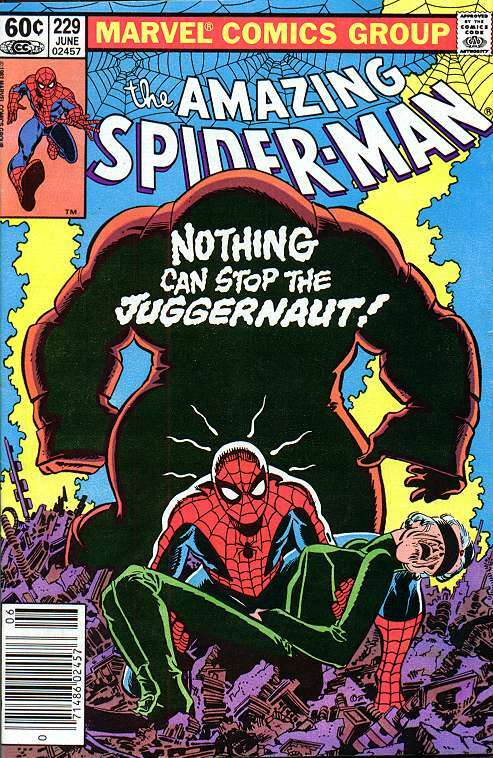 This is probably where the list gets a little more dicey for some, as I pull out this gem from the 1980s and I’m sure a few of you are thinking to yourself, “sure, the nothing can stop the Juggernaut storyline was truly epic, but was the cover?” And I’ll emphatically argue that yes it was. JRJR is one of those artists that can rub people the wrong way, and I infinitely liked his earlier work with ASM than his more contemporary stuff. But like father like son, and I feel like this list would have been bare without something from the spawn of who I think is the greatest ASM artist of all-time (spoiler alert again). For me, a great cover sets the table for an even better story inside. There’s nothing worse like seeing a flashy, super-charged cover and then opening up and finding a turd of a story on the inside. Mark Bagley has done some bang-up artwork during his run on ASM, but the 1990s was also just a terrible time for the series from a storyline perspective. As a result, a lot of his work just blends together to me. But you get it all with this cover. The foreboding shadow of the issue’s featured villain standing directly behind Spider-Man as he carries a critically injured-looking Madame Web in his arms, Spidey Sense going berserk. So much drama despite the fact that we’re talking about a generally simple spread with some elements of symmetry thanks to the domed-shape of the Juggernaut. And since Roger Stern did such an incredibly job scripting this issue (and ASM #230), the cover becomes further elevated in my mind. You look at it and instantly think of one of the best ASM storylines of all-time. So as a result, it makes my top 10. You can’t go wrong with Alex Ross! I’m indifferent to the #229 cover you selected, but I’m not familiar with the story (which you laud), so I’ll check out those issues on your recommendation (provided it is part of the Marvel Digital Unlimited subscription plan I scored for Christmas … which I have thus far been using mostly to read Lee/Ditko Spider-Man, largely inspired by your love for the character here at Chasing Amazing). Looking forward to the rest of the list … happy holidays! I love Spiderman and watched all his movies. Spiderman retro comic book cover is a great Marvel Art. If you are a big fan of Spiderman, then you are definitely going to love this product. This wooden box is ready to hang on the wall without any extra hardware. It is a perfect piece of artwork that brings up those incredible nostalgic feelings you had when you opened up your very first Marvel Comic book. You can buy it to improve the beauty of your own house or gift to your loved ones.